6 bedroom, 5 full baths. Sleeps 13. Sandy Shores Court is a private, gated community located in Seacrest, Florida. It is a short walk to both Rosemary and Alys Beach. Enjoy all of the amenities of both communities while benefiting from the security and privacy of this home. “As Good as it Gets” has 6 bedrooms, 5 baths and will sleep 14 people. Convenient private community beach access is just 150 leisurely steps away. There is parking for four cars. There are three separate A/C units for personalized cooling settings, plus ceiling fans in all rooms. With a location situated near the beach, you will enjoy gulf views and sunsets over the Gulf of Mexico from the 2nd and 3rd floor covered porches. The home has a private heated pool directly off of the main living area. (Fees apply for pool heating.) Main attractions of this home are its three King size master suites all with attached porches and private baths! There are 3 additional bedrooms and a second den area for relaxing, reading or watching TV. Ground Floor: The main large open living area is on the ground floor and flows directly into the kitchen and dining area. The living room has a large HDTV, including a Blu-Ray DVD player and iPod docking station. The kitchen has an open layout with a very large granite island, perfect for cooking and hanging out. The bar area seats four. The kitchen is fully equipped with everything you may need to prepare a meal for a large group. The dining room has a large table that comfortably seats eight people. Also on the ground floor are a full bath with tub/shower and a queen bedroom. This bedroom has 2 bedside tables, dresser and LCD TV. The laundry room with a large capacity washer and dryer is off the kitchen. Outside: Directly off of the living room and kitchen there is a large, fenced-in, heated, private salt water pool. The pool area has a table that seats 6 as well as lounge chairs and gas grill. There is an outdoor hot water shower and foot wash area. The owner of this home provides free daily set up of 6 chairs and 3 umbrellas on the beach (March-October only). Second Floor: The second floor of the home has one of the King Master Suites. This bedroom is beautifully decorated and has luxury bedding and a comfortable ottoman. The king’s private bathroom has a walk-in shower. There is also a large walk-in closet. 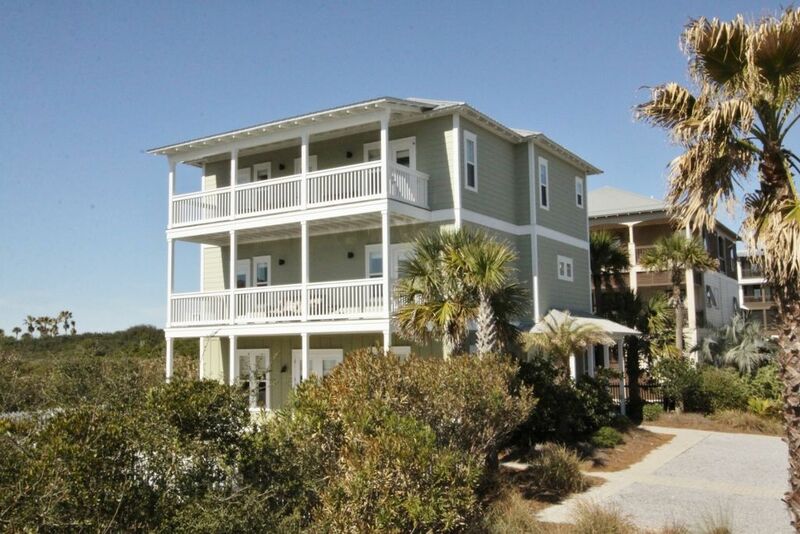 You have direct access from the bedroom to the porch where you can enjoy Gulf views and breezes. Also on this floor is the king guest bedroom which has a dresser, LCD TV and also has access to the second floor porch. This bedroom shares a bath with the queen / bunk bedroom and has a tub / shower. The Queen / Bunk bedroom has a queen bed as well as a bunk with two twins, LCD TV and a dresser. All bedrooms in the house have closets. Third Floor: There are two King Suites on the third floor. One of the bedrooms has a master bath with separate whirlpool tub, shower and walk-in closet. The other has a full bath with walk-in shower. Both suites have LCD TVs, additional seating inside, dressers, bedside tables, lamps and French doors to the third floor porch with Gulf views. Also on the third floor is a sitting area with a day bed and LCD TV. There is access to the porch from the sitting area as well. There are two love seats on this porch. IMPORTANT NOTE: Regarding pricing, a cleaning and processing fee, a $69 Vacation Rental Damage Plan Fee and tax will be added to ALL rates. Travel Insurance and pool heating are optional and can be added at Guest's choosing. Smoking only in outdoor areas. Gorgeous interior, clean, very short walk to the beach. Also reasonable walk to the pearl and Main Street. We are so glad you enjoyed your stay in "As Good as it Gets"! We hope we are able to host you again, thank you! Everything we expected from reading the reviews with the house were met, but the 1 star is missing because of the maintenance needed on the house. Walls need to be painted, living room furniture needs to be updated/replaced & the wifi needs a drastic overhaul. If a house is this big with the expectations of 8+ adults, each with a smartphone & multiple tablets, there need to be multiple WAPs &/or a faster connection. The wifi was essentially unusable & did not reach the top floor. The bedrooms are beautiful & spacious, the layout is great & the photos match the house perfectly. The pool was fun, the house is clean, plenty of amenities in the kitchen & bedrooms...soft linens, nice towels, PLENTY of pool & beach games & the proximity to the beach & downtown Rosemary Beach was perfect. This is the perfect house for our family and the second year we have booked it. My three children, their spouses and 5 grandchildren. The house is clean, well stocked with plenty of room for all. The three beach set ups are great and the gated cul-de-sac street is great for the kids riding bikes and the beach is a very short walk. The location is great within walking/biking distance to sky's beach, seacrest beach and rosemary beaches, restaurants , shops , etc. we have stayed in multiple places over the last 5- 7 years on 30a, but this house is the best location and value that we have found. We will be back next year. Great place - very convenient! We were there in early March and had the pool heated. It is a great location and we walked most everywhere we went . The home is nicely furnished and we had everything we needed to cook when we wanted to. This was our first stay in the home but plan to return each Spring! We just got back from our stay at As Good As It Gets and were so happy with our experience. The house was incredibly spacious which was great since there were 14 of us staying there (8 adults, 6 children). We especially loved that there were THREE king bedrooms - something we've never been able to find in all our years of renting. The layout was perfect. We had 4 families there, but never felt crowded or on top of each other. The beds were comfy, the bedding high quality, and the decor was beautiful and peaceful. The balconies were lovely (but note there is no longer just an empty lot in front of the house - there is now a brand new house blocking the view of the ocean) The pool was perfect to use for a break from the beach. Easy access to Seacrest and Rosemary by bike, Seaside by car. We had a small problem with one AC unit and were impressed with how quickly it was handled - great customer service. Our only disappointment was with the beach. Be forewarned that even though we supposedly have a private beach in front of Sandy Shores, we watched dozens of people walk right past the private beach signs with their chairs and umbrellas and they would simply set them up IN FRONT OF all of us who had paid to have chair and umbrella service. Apparently there used to be a security guard who helped run people off, but it was futile because there were so many of them. So the beach was super crowded and it was incredibly frustrating to have a family of 10 just plunk their stuff down in front of you and block your view. The other beach-goers who trespassed were annoying enough that even though we loved the house, we won't return to the area but will go back to Seaside where we've stayed in years past. Very sad, as we all agreed this was our favorite house we've ever stayed in. We appreciate you sharing your vacation experience at As Good as it Gets on Sandy Shores Ct near Rosemary Beach along scenic HW 30-A. It is a home that really works well for large groups. Sorry to hear about your experience with the Beach, it is private and this is not normally an issue. We will check into the situation. Thanks for staying with Sunburst for your beach vacation and we hope to see again soon.